This year, I am thankful for Western Harmony. Jam Class had a little fun in our homage to Jackass. Enjoy, and by all means, try this at home. When you wake up in the morning, before the cacophonous clutter of the day, let your tempo slide slowly south of 60pm to 48pm. Slow down before life winds you up. Just like life, but 20% slower. Use your favorite metronome if you choose. 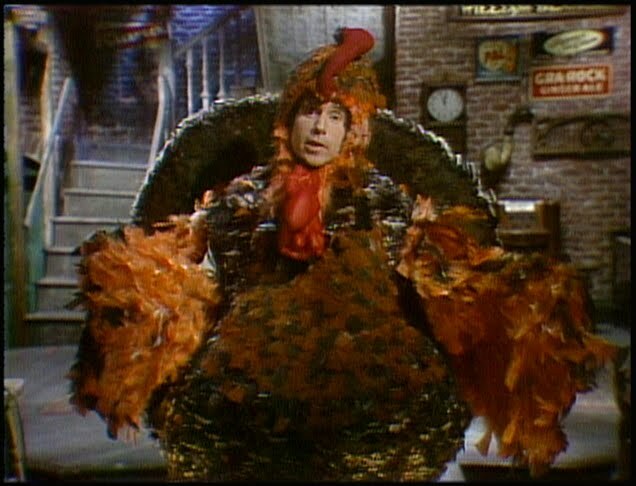 I'm not sure that anyone actually 'chickened out', but I'll be filling in last minute tonight at the Strathmore 'Tribute to Paul Simon'. Hopefully you already have tickets, 'cause this thang is already SOLD OUT! If you're out of luck, try a little tenderness with one of your friends. Who knows? Butterflies in my stomach, sure. But I'm no Turkey. I'll be there, slide guitar in hand to pay tribute to one of my heroes. Thanks to Band House Gigs for the opportunity. I'm going with 'a picture is worth 1000 words' with this particular blog post. Suffice it to say, I think about this when I hear Keith Richards talking about 'The Ancient Art of Weaving'. 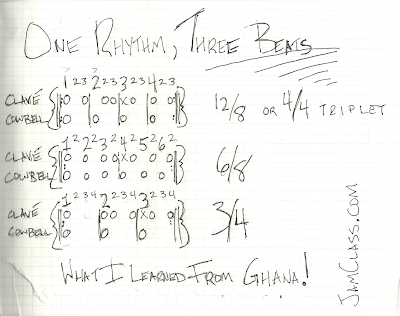 Here is an Agbekor Clavé within three different metric contexts. Don't just look at it. Do it. 2) Have a friend clap the different Cowbell beats while you clap the Clavé. 3) Then, switch: you clap the different Cowbell beats, and your friend claps the Clavé. 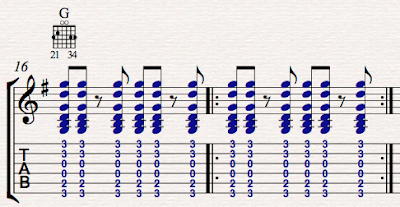 Stay tuned, I'll be posting the other parts of this song (as well as tabs!) as soon as I can. Stay tuned, I'll be posting the other parts of this song as soon as I can get them uploaded. Initiated the DC GUITAR First Friday FREE for ALL last night. Had a handful of folks come by and jam through some Bluegrass, Coldplay, Elvis Costello (More properly, Nick Lowe!) and even Robbie Fulks. That was a total blast man. I really enjoyed it. It was fun being able to keep up! More than I expected! Thank you, James. Thanks everybody who came out, learned a thing or two, and let the good times roll. Keep in touch on Facebook and find out where the next DC GUITAR First Friday FREE-for ALL is going to be. Labels: arlington VA , beginner guitar lessons , coldplay , elvis costello , free beginner guitar lessons , guitar lessons washington D.C. , robbie fulks , washington D.C. Please go to Youtube and check out The Grand Candy! As a teaching tool for my students, I've started creating video summaries at the end of each lesson that I am able to immediately email to them. It's good practice for working on my video lesson technique over at the Jam Class YouTube Channel. Here are a few videos I made at my friend Deb's lesson last week. (Check out her funky axe featured in the video!) I wanted her to have a few different strumming techniques she could practice while on vacation. 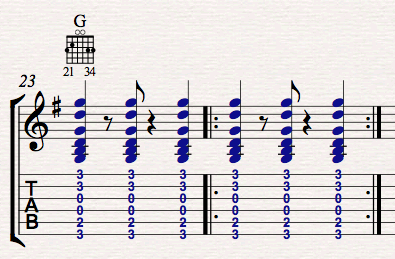 Each of these stum patterns is demonstrated on an open G chord. I call this technique a 'rest strum' as it involves placing the side of your palm on the strings to mute them, creating a musical rest. The first étude, ex. 1, has you playing a downstrum on beats 1 and 3, and muting the strings on beat 2 and 4. 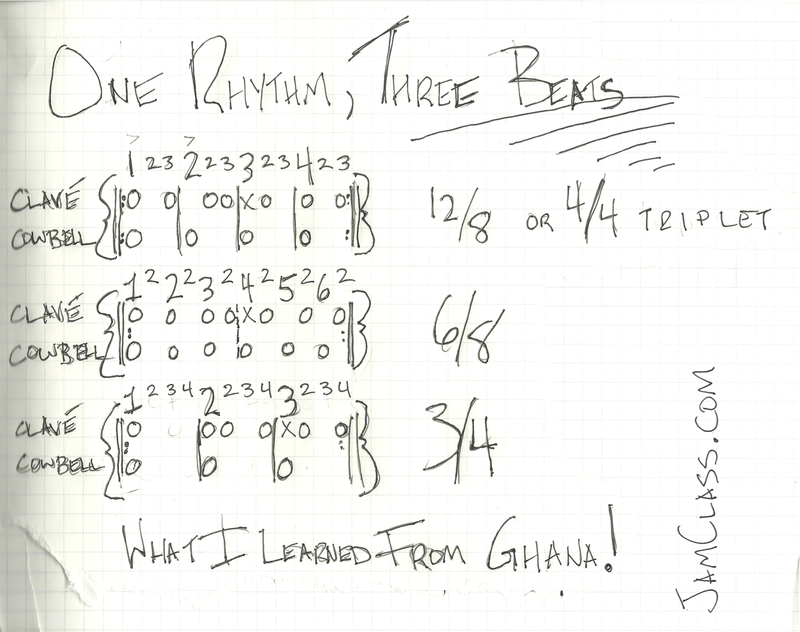 Enjoy these rhythm patterns. If you have any questions, come ahead and post them on the Jam Class Facebook page. Matt Wise is a phenomenal guitar guitar player. He's one of a few guys who've come in for a lesson where I thought, 'Oh My God. What am I going to teach him? I'm certainly going to earn my paycheck today!' Did I ever! Pete Townshend once opined: 'I Hope I Die Before I Get Old'. Well, that didn't work out so good for Pete, as he'll be 66 on Thursday. To celebrate those doubled digits, I'm doing a two day throw-down at Bangkok Blues. Thursday night at 7 I'll do a quick solo set of tunes including a bluesy variation on The WHO's seminal, and seldom performed live, 'I Can See For Miles' on Baritone Slide guitar. I'll also play some tunes by my band, The Grand Candy. Friday Night at 10PM, Jam Class rides again. We'll have a few WHO tunes in store for you. 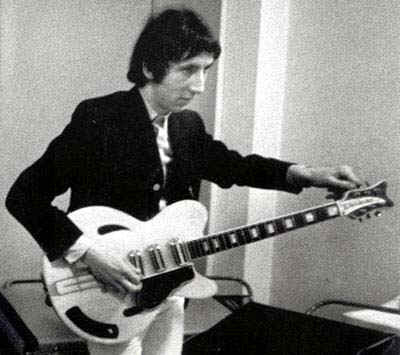 Pete Townshend stands on his own amongst his generation of iconic electric guitarists. This may have something to do with his 'See Me, Feel Me' proclivities. However you slice him, however, you can't argue that he wasn't influential. He helped define hard rock guitar amplification as we now know it. Long Live Rock, now go get your hearing checked. I gotta go practice for the shows. Hope to see some of you out there. In the meantime, here's a link to a whole bunch more fun Pete stuff. 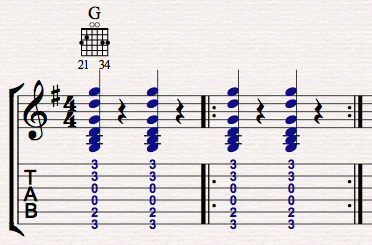 A student asked if I could break down an easy way to play Adele's 'Rolling In the Deep' today. What a great recording that song is! Here are a few clips we shot at the end of the lesson today. 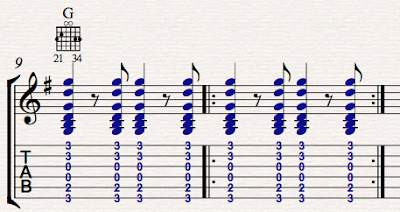 A few barre chords, some palm muting, a little finesse and you are on your way. Labels: acoustic guitar , adele , barre chords , free guitar lessons , guitar lessons , palm muting , washington D.C. Prepared Rest Strokes: Go for The Boing! 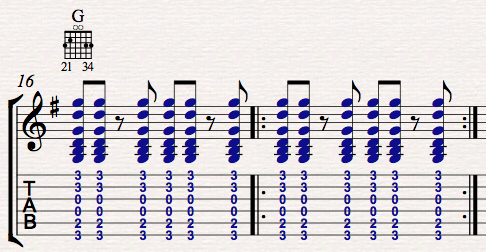 Prepared rest strokes are fingerpicking 101. The very core of your tone as a fingerstyle guitarist is formed by practicing this elementary gesture. This is from a video I shot for a student on Saturday. Normally I try to keep these under 60 seconds, so I can email from my iPhone. This is about ninety seconds. It's unedited. Have fun and go for the boing! It's as easy as 1, 2, 3: Set, pluck, relax. Labels: finger style guitar , free beginner guitar lessons , Guitar Lesson , guitar lessons washington D.C.